Please apply through our online application. We will scrutinize your application materials, contact you within 72 hours and inform you of the follow-up procedures. To help you track the process of your application, we will get in touch with you via email once a week. 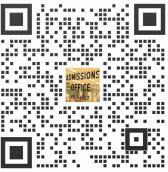 If you receive the offer from us, we will send you the Admission Notice and JW202 as soon as possible.